The Super 8 Hotel Niagara Falls, Ontario is located only a short walk away from the heart of the Tourist District, Clifton Hill, and the majestic Falls. Also located nearby is the Niagara Fallsview Casino Resort, IMAX Theatre, Casino Niagara and Lundy’s Lane excitement. This Niagara Falls Hotel offers Family, Whirlpool and fireplace suites. It also features superb amenities such as the indoor and outdoor pool with sundeck, whirlpool and sauna. Room amenities include pay per view movies, coffee and hairdryer. Free Parking and onsite dining at the Pancake Plus – House of Pancakes is also available for the guests of the Super 8 Hotel. The Super 8 Hotel Niagara Falls is a AAA/CAA – 3 Diamond property located in the heart of the city of Niagara Falls, Ontario. Guest of this great hotel are provided with ideal location to all the events in the Niagara Falls Tourist Area, the Fallsview Tourist Area and all the excitement on Lundy’s Lane. 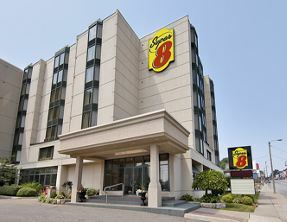 This Niagara Falls Super 8 Hotel offers 190 spacious guestrooms including the 63 luxurious suites. Some of the hotel suites include huge 2 room family suites and 2 person whirlpool suites. All rooms include coffee makers, hairdryers, pay per view movies, free local calls, and free wireless internet. The Super 8 Hotel’s amenities include indoor and outdoor swimming pools, whirlpool, sauna, exercise room, game room, gift shop, and 24-hour front desk service. Located on-site is the delicious Pancake Plus, House of Pancakes Restaurant, offering guests with a delivious meal to jump start their adventurous day in Niagara Falls. Pancake Plus, House of Pancakes is located on-site of this Super 8 Hotel. Deals and discounts are available for all guests of the Super 8 Niagara Falls.